A Diamond Select Toys release! Whether you be a friend, foe, or Godzilla himself, beware the coming of Rodan! Eight-inch coin bank figure. 10-in wing span! The giant winged pteranodon began his film career as a threat to Godzilla and the world, but since then has become one of Godzilla's occasional allies, battling invaders from outer space to protect his home planet. 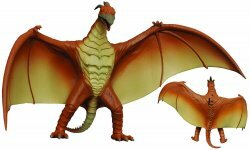 This 8-inch vinyl bank is based on Rodan's appearance in 1993's Godzilla vs. MechaGodzilla II and has a wingspan of 10 inches! With a coin slot on the back and a removable head, you'll be able to save your change for the next Godzilla bank release! Collectors Note: Brand-new and picked directly from the manufacturer's cartons. Comes bagged and tagged by Diamond Select Toys.